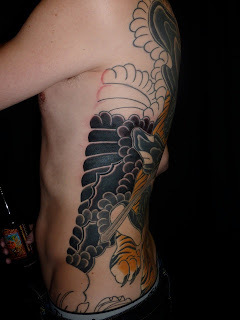 So it started that he had no tattoos and wanted a Japanese sleeve. After talking over the vibe he was going for I suggested that Shoki might represent his vision well. After he did some research on his own he resonated with the idea so much that he decided to do it as a back piece instead. 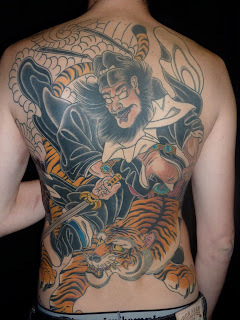 Somewhere along the line, he decided that the heavily tattooed thing was clicking for him and made the decision to do the rest of his body. Now I've got the task of bringing it over onto his arms and chest and down to the back of the knees for now. In the future we will plan on going onto the front and down to the ankles, but one thing at a time.